Prototypes provide concrete form to abstract ideas. They remove ambiguity and allow us test assumptions with experience that reflect what we want the end product to provide. And when used correctly, prototypes boost project accuracy, mitigate risk and increase project efficiency. In fact, according to the book Prototyping: A Practitioner’s Guide, prototypes reduce requests for clarification by 80%, increase accuracy by 50% and reduce post-release bugs by 25%. Communicate Concepts: Prototypes give life to new concepts, helping us communicate ideas in a way words simple can’t. Identify Opportunity: A quick paper prototyping session can help extract possible solutions from others and identify quick wins and workarounds. Create Consensus + Buy-in: It’s amazing how differently two people can interpret a feature. Prototypes are a great way to see if everyone is on the same page. Estimate feasibility: By identifying key functionality and project requirements in a prototype, teams can more accurately estimate its feasibility and effort. It allows teams to make trade-offs on what’s launch-critical vs what can be rolled out later. Test earlier and more often: Test assumptions in a cheap medium and earlier in the process. At Massive, we create different kinds of prototypes depending on the project requirements and the kinds of feedback we’re looking for. Below we’ve broken down two kinds of prototypes (low-fi and high-fi), their pros and cons and some tools to help make them. Here at Massive, we use low-fidelity prototypes to in meetings and design workshops to test assumptions and achieve clarity and consensus on key features. Massive team sketching out a rough low-fi prototype on the whiteboard. No software required: Can be done using sticky notes, chalk/whiteboards, paper, etc. Paper prototypes (for example) demands a lot of imagination from users and stakeholders. Middle and high fidelity prototypes are useful when user journeys, features and navigation have been identified. For this reason, it’s not uncommon that they are a next step after low-fidelity. Links to hi-fi prototypes are sometimes shared to unknown stakeholders, allowing for conflicting feedback and ambiguity. Some tools can become costly, especially when pricing model is based on # of projects and users. With so many prototyping/mockup tools available, how do you choose the right tool? 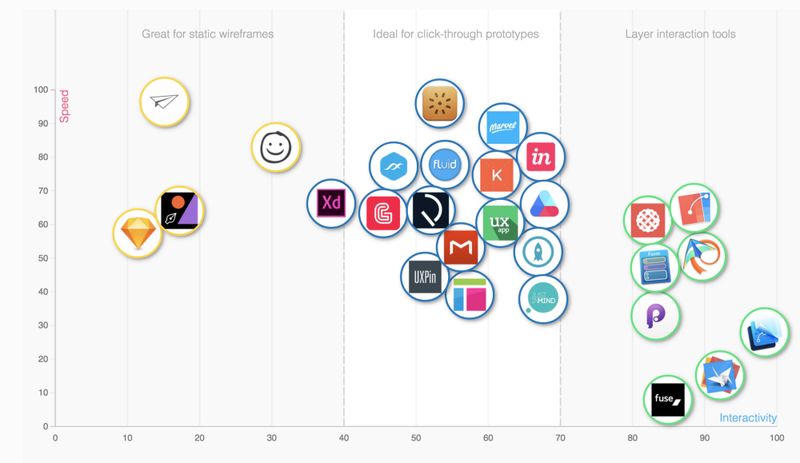 The smart folks over at Prototypr put together this amazing resource to compare prototyping tools based on different needs. What’s your favourite prototyping tool? Did we miss it?